The Walt Disney Acropora has been around in the trade for close to two years but this beautiful Acropora species still commands a pretty penny. At $800.00 – $1000.00 for a small frag this is one of the more expensive Acro frags you will find. We are not sure from where this coral was collected but we are happy to see it being traded within the hobby from tank raised frags. The Walt Disney Acropora is actually a stunning color morph of Acropora tenuis, a very common Acropora species found in many SPS lovers aquariums, just not with this coloration. 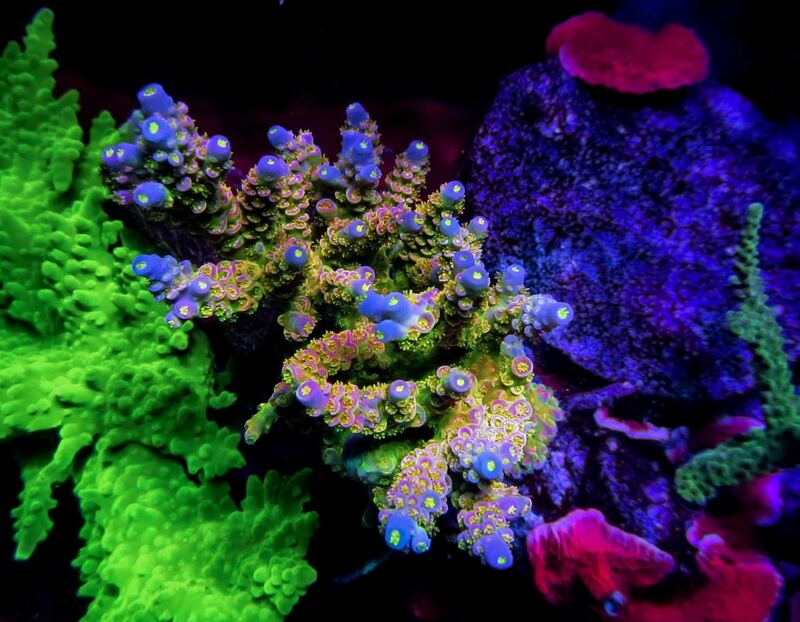 Acropora tenuis is a fast grower that is typically seen in shades of blue and green but the Walt Disney Acro appears to have found every color found in a rainbow. The Walt Disney Acro holds coloration better under LED lighting with a higher concentration of royal blue. We suspect that corals like the Walt Disney must reside in remote location making them difficult to collect, otherwise corals like the Walt Disney would have been in the aquarium trade for many years now. Regardless, I think you will agree this this is one special acropora. If you are one of the few that have a frag of this coral or if you have another special coral that you would like to share with our readers then please contact us here.